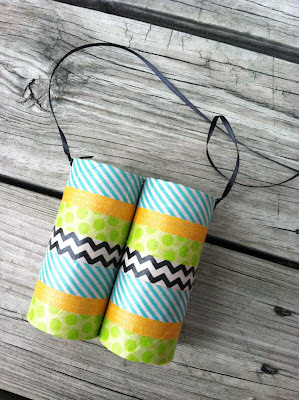 I wanted to share this kids craft that I posted about on my old blog a while back It was a big hit with my kiddos. It’s a great craft for kids to do themselves or you can make it for them. Either way, they will love them, especially with Spring just around the corner when they’ll be spending more time outdoors again. The first step is to decorate your rolls with washi tape. This is the fun part! You can make them look however you want! I used scissors to cut the tape so that my lines would be straight, but you can definitely just tear it. Step two is attaching the two rolls together. I used a stapler and attached them together where the washi tape seams came together. I didn’t really want to get out my glue gun, so I convinced myself that the staples would hold better anyway, and it actually worked out great! *note* If you’re worried about the staples not being safe for your kiddos, then you can attach them together with glue or even tape. 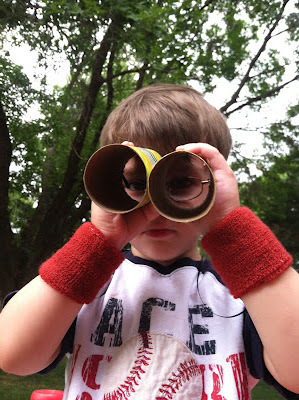 This was not an issue with Hudson’s binoculars, but I made some for Harper too (so that she wouldn’t constantly be trying to steal Hudson’s) and I made sure to press the sharp ends tight to the cardboard and then covered them with pieces of washi tape. Once the rolls are attached, the final step is to make a hole on each side of the binoculars (either with a hole punch or scissors) where you want the string for the strap to be.Then chose a ribbon or string, whatever you have lying around, string the ends through the holes and double knot. 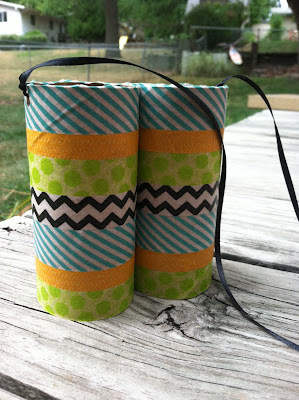 You now have an awesome pair of washi tape binoculars!! 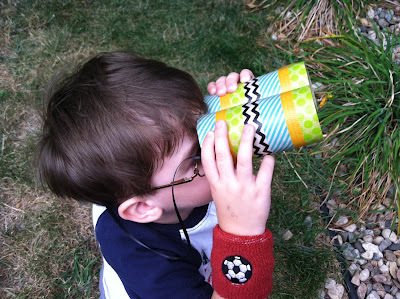 Okay, now go make your kids, or yourself some cute binoculars!